The TSO bull is back in the ITIL china-shop. Tweet this. 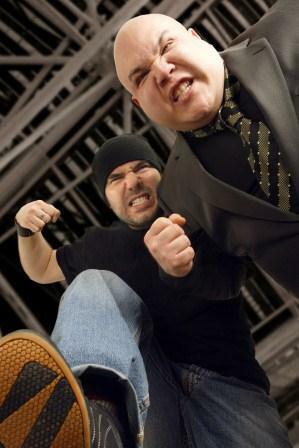 TSO are acting like a legal bully and the world should know it. Especially they should know it right now, as the Cabinet Office are negotiating the sale of ITIL's rights. If this is Castle ITIL's idea of how to build a community, then ITIL's demise looks ever more certain. The legal department of The Stationery Office (the publishers of ITIL, under contract to the UK government) sent a letter to the publisher printer and distributor (see below) Lulu.com (not me) complaining that my book Owning ITIL® "contains the Intellectual Property associated with ITIL". This was puzzling. More than that, it was bloody annoying, as Lulu delete a disputed book without recourse, the big pussies. If anyone else has had a take-down notice for their book, please contact me (I am aware of others: I think the TSO lawyer ran off a batch of letters). Who knows, there might be potential for a class action here. It was especially annoying once I established just how trivial and vexatious the complaint really was. TSO's action was puzzling because there is no content from ITIL in my book at all, not even brief quotes that would fall under the terms of "fair use" anyway. 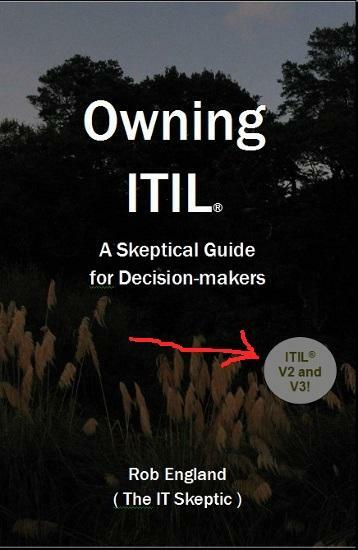 TSO's issue was not even the use of the word "ITIL" (with acknowledgement of the trademark) in the title of the book. As I have tried several times to convince some particularly thick characters on the Lulu forums and elsewhere, I have advice from an international IP lawyer that it is legal to write a book about a trademarked name, and to consequently refer to it in the title. I believe the term is "commentary". My book's title "Owning ITIL" does not purport to be part of ITIL and the cover makes it very clear that it is not associated with ITIL. Moreover the book is arguably at-least-partly-satirical in nature, which would further undermine any legal position vis-à-vis the title. But it's not any of that. TSO objected to a small graphic on the cover of my book which said "ITIL V2 and V3" meaning the book covers both versions of ITIL (The book came out not long after the V3 launch. Yes TSO have only just got around to attacking it). TSO claim that little sticker-like dot on the cover implies my book is an official ITIL book. This is of course absurd. Incidentally the back cover states in 12-point type "This book is neither part of nor associated with the IT Infrastructure Library®. This book and its author are not endorsed by any organisation." At least that is what TSO claim the original complaint was to Lulu. Lulu won't give me a copy of their letter and nor will TSO. TSO's lawyer has ignored repeated requests for a copy, and I'm beginning to think the original complaint was just an ambit claim about any book with "ITIL" in the title. I'm beginning to think that once I challenged them they are now scrambling to find something else to fault the book on and they fell upon the little sticker on the front. Lulu said to me that TSO's assertion was that the book "contains the Intellectual Property associated with ITIL", which adds weight to my theory. Of course I can't prove any of that, but in the absence of them performing the basic business courtesy of providing me a copy of their letter, I guess I'm free to speculate, aren't I? [Update: I have finally received a copy of the original letter from TSO to Lulu. it supports my assertions above. it refers to a number of books. It makes a vague ambit claim to "trademarks... and Crown Copyright material" without any specific assertions about any of the books. Yet it asks for evidence of a license and threatens legal action. BTW, I finally checked: Lulu are only my publisher in practice not law. I am the legal publisher of this particular book. I own the ISBN and my company's name is listed as the publisher on the Lulu website and inside the book. TSO should no more have complained to Lulu than to Amazon or Barnes and Noble. In the case of this book, Lulu are solely one of my printers and distributors. This is final evidence for me that TSO don't actually LOOK at any book before letting the legal dogs off. TSO did not have the decency to contact me in the first instance as the author of the work, nor even to copy me on the letter to Lulu.com. I don't think I'm hard to find. TSO could have contacted me and expressed a concern. We could have discussed their concerns like gentlepersons. They could have checked their facts. I could have taken the book down gracefully if their claim had substance. Instead they made assertions about me to my business partner without first informing me. They knew these assertions would disrupt my ability to earn income, regardless of their accuracy. It's not about the money: I make about US$70 a month off the book. By bringing on the lawyers I'd be likely to spend far more than I have ever made off the book since it was published over three years ago. The book is back on Lulu, but only after some serious bollocking, and only after I agreed to remove the "dot" with no admission of liability, solely to avoid further argument. I had to fight this: otherwise TSO can use this bullying tactic with any competitor who dares to write a book about ITIL. As I said, Lulu deleted my book with no means of appeal because everybody runs scared of the copyright lawyers these days. I want you to know the kind of people you are doing business with. I don't think they can be allowed to get away with this. I'm a tiny little competitor to TSO. They sell books about ITIL. I sell a book about ITIL. Are they allowed to play the IP card with every competitor? Where's the governance in that? Where's the separation of duties? TSO are acting like a legal bully and the world should know it. Especially they should know it right now, as the Cabinet Office are negotiating the sale of ITIL's rights. If this is Castle ITIL's idea of how to build a community, then ITIL's demise looks ever more certain. Tweet this. It is disheartening.